Backup power system: A generation system designed and operated to provide emergency backup power during utility grid outages. 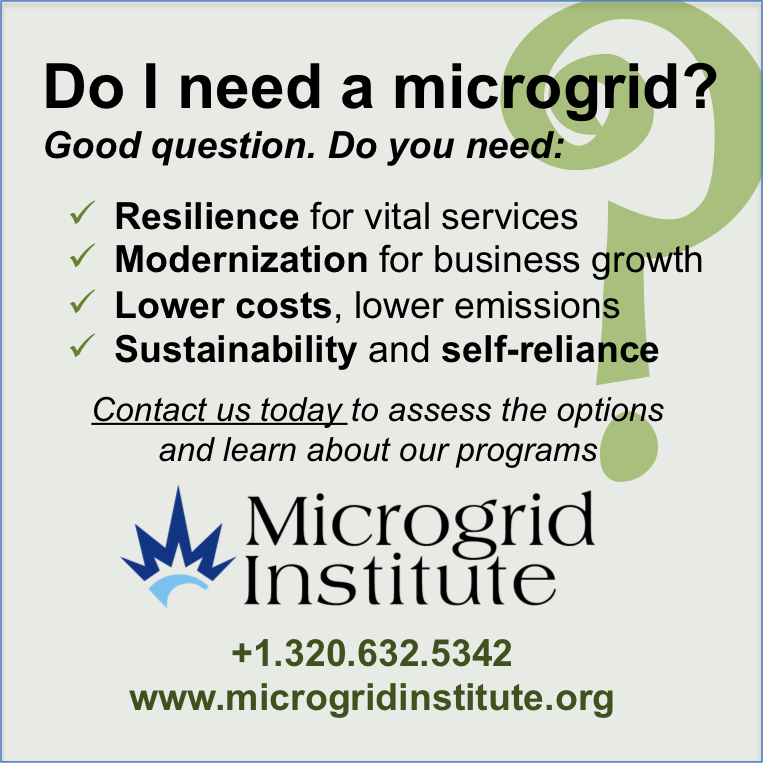 A microgrid can be defined as a sophisticated backup power system. energy supply and demand to maintain stable system operations. Both microgrids and large-scale utility grids perform balancing operations. Campus microgrid: A microgrid serving assets within the perimeter of a discrete campus -- e.g., a university, corporate, or government campus, a prison, or a military base. Campus microgrids generally do not cross public rights of way or incorporate public utility infrastructure. Combined heat and power (CHP) (a.k.a., "cogeneration," "trigeneration" or "waste heat to power"): CHP systems supply both electricity and thermal energy, and can comprise the generation foundation of an efficient and economical microgrid. Community energy development: Pursuing multiple complementary energy projects to improve the collective sustainability and resilience of a community. Community microgrid: A microgrid system serving a group of customers, likely including municipal or other public facilities as hosts or tenants. In general, community microgrids cross public rights of way and serve to modernize local utility infrastructure. Demand response (DR): Energy loads capable of being reduced, deferred, or curtailed in response to signals regarding such conditions as energy prices or system constraints. Distributed energy resource (DER): Generally any form of decentralized generation, storage, or demand management capability. Distributed generation (DG): A small power plant located near an end-use customer, often interconnected with the low-voltage utility distribution grid (versus the high-voltage transmission system). District energy system (a.k.a. district heating and cooling): A local system that provides thermal energy for multiple facilities -- usually heating and domestic hot water, and sometimes thermal processes and cooling. District energy strategies can produce substantial energy savings and emissions reductions, as well as greater local resilience. Energy improvement district (EID): A vehicle used by local and state governments to promote planning, development, and funding activities supporting energy infrastructure improvements in a defined geographic area or community. Community leaders are considering microgrids as part of energy improvement district planning. Energy management system (EMS): Software and hardware for balancing energy supply (including storage) and demand to maintain stable operations. Energy service company (ESCO): A non-utility entity that provides retail, commercial, or industrial energy services. Green building and smart building: High performance building designs can incorporate microgrid technologies and control structures. IEEE 1547.x: A set of industry standards for interconnecting distributed energy resources to electric utility systems. IEEE 1547 is being amended to accommodate microgrids and higher penetrations of DERs. Integrated planning and development: Planning and executing projects in a way that considers multiple objectives and opportunities. Integrated planning and development leads to greater benefits for less investment cost. Interconnection: at the point of coupling, interconnected systems are synchronized to the utility grid -- their frequency, voltage, and phase angles are matched to allow seamless interaction. IPP: Independent power producers are non-utility companies that generate and sell energy to one or more customers. Microgrid: A small energy system capable of balancing captive supply and demand resources to maintain stable service within a defined boundary. There's no universally accepted minimum or maximum size for a microgrid. MUSH: Military installations, universities, schools, and hospitals. Many of the first commercial microgrids are being installed for customers in MUSH applications. Nanogrid: A microgrid serving a single building or asset, such as a commercial, industrial, or residential facility, or serving a dedicated system, such as a water treatment or pumping station. Net-zero: The condition in which a building, campus, or complex is capable of generating energy equal to its aggregate annual consumption. Off-grid microgrid: A microgrid that's not interconnected with a local utility network. Off-grid microgrids generally are located on islands and remote sites, such as isolated rural communities and mining camps. Photovoltaics (PV): Solar-electric energy cells in any of numerous forms and configurations. Plug-in electric vehicle (PEV): Transportation vehicle with an onboard electricity storage system and the ability to charge from an outside power source. Smart city: A community that plans and develops infrastructure, buildings, and operations to intentionally optimize efficiency, economics, and quality of life. Smart grid: A energy system characterized by two-way communications and distributed sensors, automation, and supervisory control systems. A microgrid is a small energy system capable of balancing captive supply and demand resources to maintain stable service within a defined boundary. Microgrids combine various distributed energy resources (DER) to form a whole system that's greater than its parts. Microgrids combine local energy assets, resources, and technologies into a system that's designed to satisfy the host's requirements -- which can include factors as basic as electrification, and as complex as integrating variable DERs in a balanced net-zero system. as part of local planning. and so do economic factors. What all microgrids share in common, however, is the need to optimize both energy usage and generation to achieve customer goals for resilience, reliability, and sustainability. The best microgrids will do all of that in the most economical way possible. The number of installed microgrids is small, but it's growing in many regions around the world. The International Energy Agency (IEA) estimates that to achieve its goal of universal access to electricity, "70% of the rural areas that currently lack access will need to be connected using mini-grid or off-grid solutions." Fully grid-tied systems that can't operate in island mode aren't microgrids, but instead are defined as grid-tied distributed generation (DG). Also, backup systems that serve very specific, limited loads and don't otherwise actively balance supply and demand, might be considered microgrids, but arguably they are more properly in the categories of uninterruptible power supply and simple backup systems. Transactive energy: A market system in which services are priced dynamically for individual nodes and resources, on the basis of system constraint conditions. UPS (uninterruptible power supply): A power system that maintains continuous electricity service for specific appliances or circuits, avoiding even momentary interruptions in service. UPS systems generally rely on storage batteries, with backup generators for larger systems. V2G: Vehicle-to-grid technology, integrating PEVs together for dispatchable electricity storage for grid support and ancillary services.